A useful guide for visitors and tourists available in 5 languages (Japanese, English, Chinese, Korean and Thai). What is the Tokyo Metro Guide? Tokyo Metro distributes a convenient pamphlet, useful for sightseeing in Tokyo. It contains basic information on riding the train, sightseeing spots, guide of airport access, convenient discount tickets and a Tokyo subway map with index for easier identification of each stations. It can be found at Narita Airport Terminal 1 and Terminal 2 (at the Tourist Information Center (TIC)) and most Tokyo Metro stations. However, they are not available at the following stations: Kita-senju (Hibiya Line), Naka-meguro, Nakano, Nishi-funabashi, Yoyogi-uehara, Wakoshi and Meguro Stations. 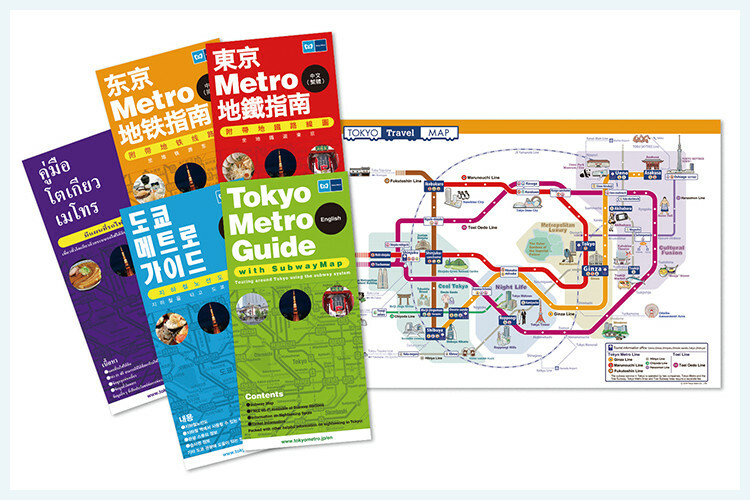 You can download a PDF copy of the Tokyo Metro Guide here. To view PDF files, it is necessary to have Adobe® Reader® installed on your computer. Tokyo Subway Navigation for Tourists is a free application officially provided by Tokyo Metro to enable users to search transfer information for the Tokyo Subway network (Tokyo Metro and Toei Subway). This application is available in English, Chinese (Simplified and Traditional), Korean, Thai and Japanese. It is highly recommended for visitors sightseeing in Tokyo. Copyright © Tokyo Metro Co., Ltd. All rights reserved.